The mammals of Presqu’ile may be the creatures that have had their populations most altered by human settlement. Before European settlement large mammals such as Black Bear, Wolf, and possibly Elk and Moose were present. Today these animals are only found in other, more remote parts of the province, though individual bears have been known to wander into the park every decade or so. Conversely there are species that were not present here in 1900 or even 1960 that are common at Presqu’ile today. White-tailed Deer, while surely present in the park before European settlement, were gone by 1900 and were actually re-introduced to the park in 1920s by the then controlling Park Commission. Without any natural predators, by the 1990s the deer population had grown to such an extent that their numbers were seriously impacting the ecology of the park. Almost no spring wildflowers or new tree seedlings had been seen in the park for almost a decade when deer control measures were started in 2003. By 2007 the deer population was back down to a level the park could naturally support. The status of Grey (Black) Squirrels and Eastern Chipmunks in the park before European settlement is not clear but by the 1960s the only chipmunks seen where near the main office and Black Squirrels were unknown in the park into the 1980s. The conifer and dune habitats between the park gate and the campgrounds formed a barrier to these animals and kept them out of the main part of the park. How the chipmunk finally arrived into the campground area is not clear but it is known that Black Squirrels were deliberately released into the park by a local resident removing them from his property, and thus altering the ecology of the park forever. In August 2013 the Park recorded its first new mammal in the park in years. A Virginia Opossum was seen roaming the campgrounds after dark by patrolling park wardens. The opossum is at the north edge of its range here and while it has been known to come into this part of Ontario in the past, it has trouble surviving harsh winters and usually disappears again. So while many were seen in the Brighton area in 2102-2013, only time will tell if it becomes a permanent part of Presqu’ile’s mammal fauna. Mammals are also still disappearing. An introduced fungus, known as White-nose Syndrome is devastating the populations of colonial bats in eastern North America. The Little Brown Bat, once our most common bat, has suffered a reduction in population of 94% from 2010 to 2013. The status of the current population in the park is unknown. It is estimated that Little Brown Bats will be functional extinct by 2026 unless some cure to the disease is found or some natural resistance miraculously occurs. We are witness to an ecological disaster. While 39 species of mammals have been recorded in the park, a visitor to the park will probably see very few of them. Most are small and nocturnal and in fact we know very little about the populations of most mammals in the park. The most commonly seen mammals are the Eastern Chipmunk, Black Squirrel and Red Squirrel since they are diurnal creatures. Also regularly seen, usually at dawn and dusk, are White-tailed Deer, Red Fox, and Eastern Cottontail. Northern Raccoon and Striped Skunk could also be seen then but they are just as likely to be seen roaming the campgrounds after dark foraging for food. Please keep your food secure at you campsite and resist giving these and other mammals handouts. Such behaviour will only end badly for both you and them in the long run. 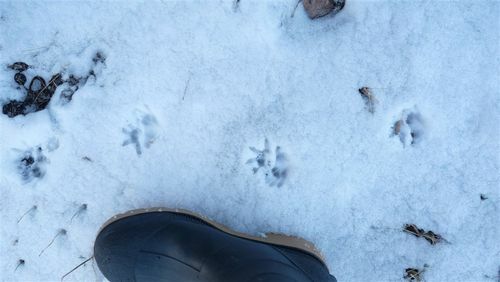 One of the best ways to get to know the mammal population of the park is to visit in winter after a snowfall and follow the tracks of the various mammals about and see what is around and what they have been doing. Click here for a checklist of the mammals of Presqu'ile.